When one thinks about Design and cars that have marked its evolution, one has to think about the Italian Design and the masterpieces that it has produced from the very beginning of the automobile industry. And when one thinks at the Italian Design, it is a must to consider Giorgetto Giugiaro: designer, entrepreneur, part engineer, part bluecollar, part welder, part all the rest. A man who, worldwide, was, and still is, a point of reference in the automotive sector, creator of some of the most beautiful and memorable cars in the world. Alfa Romeo Giulia Sprint GT, VW Golf I, Lotus Esprit, De Lorean DMC-12, FIAT Uno, FIAT Panda, just to name a few, and to recall your best memories. Trend setting cars, best sellers, functional and engraved in people’s hearts. Good stories. If something has to be said about design, one has to listen to what he has to say. 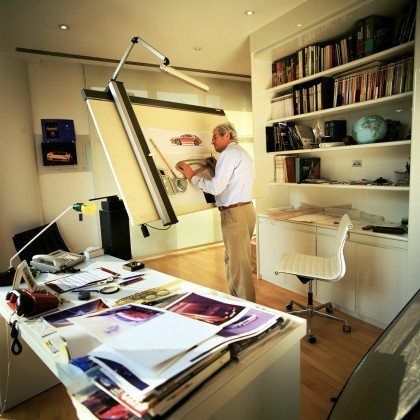 Here is the interview with Giorgetto Giugiaro. Read carefully: there is much to learn from the Master. Just a few months ago the Italian publishing house Zanichelli, asked me to give my definition of “Design” for the new dictionary of the Italian language: “Compared to the artistic product, Industrial Design and Car Design represent a compromise among reality and the constraints imposed by industry and market. Design plays a unique role in mediating between people, objects and services that are part of everyday experience: “applied” creativity allows the designer to depart from the existing in order to transform it, applying changes capable to provide factual benefits, and not only aesthetic value. Clients ask designers concepts, forms and functions that not only fulfill nowadays needs, but anticipate what is going to come, predicting changes. In your opinion, how important is it and how much does it matter to have a method of design, and how much you can rely on intuition? The design method is crucial. Besides, the name says it all: design in English means “project”. The first step is the representation in orthographical projection of the car: this way we know since the first sketch that the car is feasible. This method, which we have refined over time, allows us, from the very beginning, to save both time, and development costs. Intuition can certainly be useful, but should never be an end in itself; it must be put at the service of the project, respecting all its requirements. How important is in your projects and sketches the knowledge of the methods and processes of production? I always say that a good designer must also be a bit an engineer. He must hold a minimum knowledge that allows him to support, even in the production process, the design and project solutions he has in mind. It is a knowledge that I have gained from my experience in FIAT, and which I have continued to grow over the years: I have been able to overcome the resistance of more than one engineer, especially when new solutions were at stake. Afterwards they proved to be successful and became a standard of production. If I had not been sure that my idea could be realized, I probably would have abandoned it, and it would have been a pity. What is the car that you love the most, and the one that has had been the more successful? If they do not coincide, what makes you love the first one, and what made the success of the other one? I am not particularly tied to the cars that I have created in the past. I do not like to stick to a car because throughout my career I have learned, once I conclude a project, to always look to the next one, to the future. When it happens to me to look at “old glories” like Panda, Golf or Uno, I can not avoid to think about some aspects that, today, inevitably, I would do in a total different way. In your opinion, what kind of training and education has to be followed by those who have passion and talent to become industrial designer? One needs goodwill and spirit of sacrifice. Our society do not train young people to acquire them. It is harsh to say, but one has to rethink things, in other terms. Without too many illusions. The job market has changed its dynamics, and the space to emerge and diffuse one’s ideas has shrunken dramatically. Knowing how to sacrifice one self, learning patience, make savings are the basic elements. Then it has to be understood that one has to know everything that affects ones work. A designer – a would-be one – who is studying the idea, sketching the idea, to translate it in practice, moving the idea into the physical and rational world, has a long, challenging course, in front of him. As I already said, he must master the technical aspects; he needs to know, for example, welding methods and procedures, todays materials compositions and behavior; which are the available glasses, how they are shaped, and must also have a working knowledge of economics. One has to me a blue-collar, a technician. One cannot only dream, but has to walk the world of operations. It is crucial. The use of computer based tools and virtual systems is a risk or an opportunity? In Italdesign Giugiaro we were among the first in Europe, in the late 90s, to install and use virtual reality systems. I have always been convinced that technology is a tool that, if used smartly, can only help. By virtual designing, one can cut costs and development time. The computer, as well as 3D design tools, are used by men to visualize their ideas, but the most useful tool of all is still the brain. Cadillac Man: fantasy or reality? Some interesting data collected in Italy, useful… everywhere!